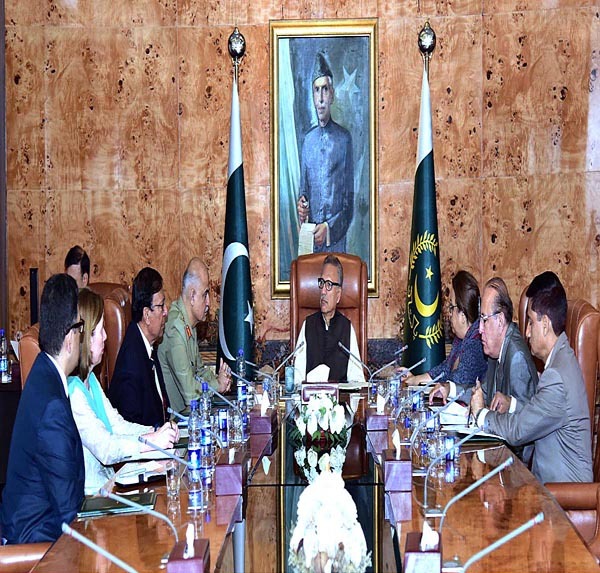 ISLAMABAD, Oct 10 (APP):President Dr Arif Alvi Wednesday stressed the need for improvement in the standard of medical education to produce professionally competent doctors and ensure provision of efficient healthcare services. Talking to National University of Medical Sciences (NUMS) Vice Chancellor Lt Gen Syed Muhammad Imran Majeed here at the Aiwan-e-Sadr, he said quality medical education was of pivotal importance as it was directly linked to precious lives. The president underscored the role of qualified and professional faculty in producing quality medical graduates. He said values of integrity, honesty, responsibility and dedication needed to be inculcated among young medical professionals. He appreciated the services of NUMS in healthcare sector and stressed that national and international educational must be followed to make NUMS one of the leading medical universities of the world. He also underlined the importance of creating linkages between national and international universities to learn from each other. Lt Gen Syed Muhammad Imran Majeed briefed the president about matters pertaining to NUMS and the plans to fully utilize the existing opportunities to ensure efficient medical services.